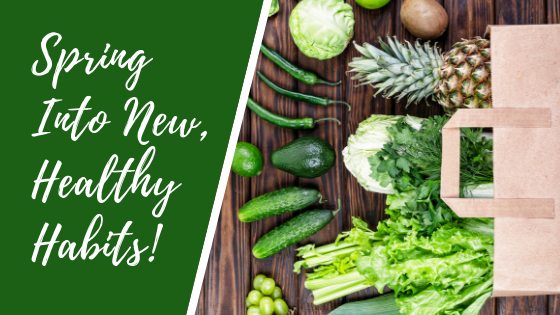 Spring Into New, Healthy Habits! How to help people make and sustain healthy habits has been an over-arching, and sometimes frustrating, career-long problem I have pondered and explored. The reason I still search for answers is that, despite the alarming plethora of symptoms, syndromes and newly named health conditions springing up today, the vast majority of health issues can still be resolved by adopting healthy habits over the long-haul. However, getting my patients to do this has been more of a challenge that I naively anticipated. At heart, I am a teacher as well as a health professional who whole-heartedly believes in the power of the body to heal. Although I have learned that not everyone shares my enthusiasm for the details of how the body works, I still believe it is important to understand a little of the “how and why” behind making changes. So I try to explain the basics of how the body works and what various symptoms mean. The challenge has been that, while knowledge and information may be enough to inspire the intension or fear needed to begin to make changes, it is not enough to sustain healthy habits in the face of the overwhelming and ever-present unhealthy temptations that abound. What I now know is that most people want the results and start out earnestly determined, but shortly lose their way. We humans are built for immediate gratification. When desired results require long-term commitment, it is dismally easy to revert to the habits and routines familiar to us. I’m also suspicious that many people really don’t think their habits are all that bad. I mean, when you look around at your friends and family, aren’t most people doing about the same things that you are? And most of them appear ok, right? We are very tribal at heart and it is ingrained (although subconsciously in today’s culture) to keep within the norms of our tribe. There is so much individual variation in the body’s ability to adapt and how any given toxin or lack of nutrients affects a person’s health. One person may be able to sustain bad habits for a lifetime and live a long, relatively healthy existence. Another person, in a similar environment, may react to a smidge of toxic chemicals or processed food with debilitating symptoms and ill-health. We have to stop comparing ourselves to those around us when it comes to our habits. It just doesn’t serve us well or help in the mission of achieving better health. After much research and boiling it all down, here is what I have discovered are the crucial elements to making and sustaining healthy habits. If you are suffering some unwanted condition and it is affecting your quality of life or outlook and you truly want to change some habits to see if it makes a difference, the following is for you. Just Do It! While not always good advice, when trying to make changes, Fake it ‘til you make it, works. The act of forcing yourself to do something differently can turn into a habit, if done for a period of time – usually at least 21 days. After that, you will need more ammunition to avoid the barrage of interruptions and temptations in life that can sabotage your newly formed habit and cause you to revert. Plan and Prepare! The old saying, Failing to plan is planning to fail, is absolutely true when it comes to sustaining healthy habits. We all know that life throws lots of curve balls and if you don’t have a plan, a back-up plan and a back-up-back-up plan in place, you will be ill-prepared for the wearying number of stumbling blocks you WILL encounter. So, when setting goals, be sure to have strategies in place for when things go awry and you are tempted to go off-course. Have your weekly plan and back-up plans handy to review at all times. Make your health and well-being a top priority. Many people tell me that health is a high priority in their life, but I don’t see that reflected in their habits. The conclusion I must draw: either they don’t fully understand the power of their daily habits to influence their health, or they don’t truly value their health over other commitments. I think it behooves each of us to periodically evaluate how we are spending our time, effort and finances and whether our actions are actually in accord with our stated priorities and commitments. I call this congruency in your life. From my perspective, since your health affects all other aspects of your life, it needs to be one of the top five priorities in your life. Even if you practice all of the above, changing habits still is not an easy process. Take it one baby step at a time, keep track of your progress, reward your successes and remind yourself that you are in this for the long-haul. Don’t let short-term set-backs derail you. Consistency over time is the key to success!